THERE will be few moments during Ronald Reagan's funeral service on Friday more affecting than Lady Thatcher's ten-minute eulogy. It will not just be the warmth of Lady Thatcher's words which will stir emotions and memories. There will be added poignancy because, despite her insistence on being present in the National Cathedral to say goodbye to her old friend, increasing frailty and medical advice forced her to record her tribute before Mr Reagan's death. But before succumbing entirely to sentiment, it is worth recalling that theirs was a complicated and often tempestuous relationship. They were drawn together from the outset by a shared belief in the moral superiority of societies founded on free enterprise and the imperative which followed from that of confronting internationally the menace of Soviet communism. They also took real delight in each other's company. He admired her poise and steely intelligence. She was charmed by his good humour and beautiful manners. But their personalities and the way they worked could hardly have been more distinct. And the different ways they responded to events led, at times, to considerable tension between them. While Mr Reagan believed in setting the broad direction for his administration and delegating the detail of policy and its implementation, Lady Thatcher reckoned that the only way to keep her ministers honest was to know as much about their departments as they did themselves. While Lady Thatcher maintained a punishing schedule, rarely sleeping more than four hours a night and resenting the interruptions caused by other people's holidays, Mr Reagan lived up to his oft-quoted quip: It's true hard work never killed anybody, but I figure, why take the chance? While Mr Reagan radiated a sunny it'll be all right on the night cheerfulness, Lady Thatcher had a darker, more Tory, view of human nature. One big difference in the early days of their governments was over economic policy. Although both set out to liberate their economies, Lady Thatcher, a shopkeeper's daughter at heart, believed that tax cuts were the prize for getting spending under control. By contrast, Mr Reagan thought it just fine to slash taxes, while leaving the job of cutting spending to others (and when they didn't, that was just fine too). The British government disapproved of Reaganomics' spiralling trade and budget deficits and their impact on the international financial system, not least in the form of the surging dollar. But those disagreements were nothing compared to the anguish caused by Mr Reagan's ambivalence over the Falklands. Friendship and the ties of the special relationship aside, the prime minister assumed that the illegality of the Argentine invasion in early 1982 and the need to support a NATO ally acting in self-defence would mean unstinting support from her chum in the White House. When Mr Reagan made it clear that America's role was to act as an honest broker mediating between two allies and trying to prevent the retaking of the islands by force, the prime minister felt something close to betrayal. After weeks of fruitless shuttle diplomacy by Alexander Haig, Mr Reagan's erratic secretary of state, and increasingly bizarre behaviour on the part of Jeane Kirkpatrick, the pro-Argentine UN ambassador, the junta's intransigence finally pushed the president off the fence. But as far as the British government was concerned, it was not the president who was the hero of the hour, but the defence secretary, Caspar Weinberger, who, on his own initiative, provided the task force with vital intelligence and with urgently requested air-to-air missiles. It took all of Lady Thatcher's self-control to conceal her dismay over Mr Reagan's dithering. The falling-out over the American invasion of the tiny Commonwealth island of Grenada 18 months later was more public, but impinged less directly on British interests. Lady Thatcher believed the invasion would give the Soviet Union an excuse to intervene wherever it felt like doing so. Worse still, the White House had failed to warn her about what was to happen, thus reopening the controversy over the launch procedures of the American cruise missiles about to be deployed in Britain. Disarming Mr Reagan's apparent willingness to do a deal with Mikhail Gorbachev at Reykjavik in 1986 to scrap all nuclear weapons was a far more serious affair. Lady Thatcher had persuaded the president that Mr Gorbachev was a man one could do business with, but this was ridiculous. Never mind that in practice nuclear weapons could never be disinvented. Had Mr Reagan forgotten that it was nuclear weapons that had kept the peace in Europe by offsetting the overwhelming superiority of Soviet conventional forces? 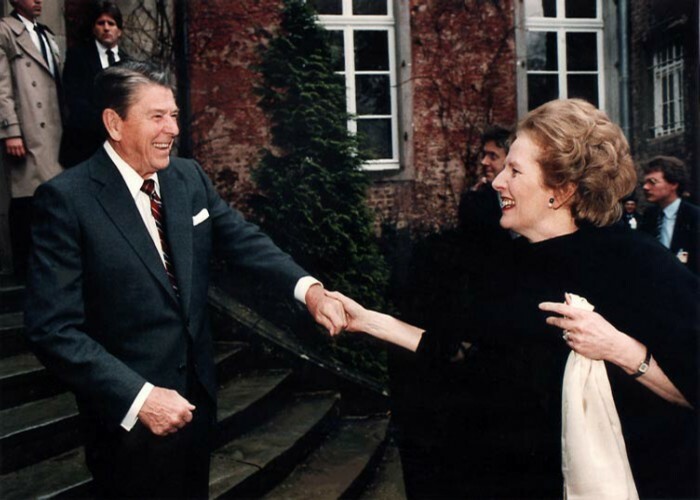 It was clear to Lady Thatcher that Mr Reagan had fallen head first into a none-too-subtle Soviet trap. A hastily convened meeting with the president at Camp David restored some sanity to the continuing arms-control negotiations. But her confidence in his judgment had been shaken once again. Still, Lady Thatcher could never stay angry with Mr Reagan for very long. She blamed his lapses on malign subordinates (which says something of her view of his grip on the job). And, following the upsets, he would apologise as only he knew how. After Grenada, he rang to say that next time he dropped in on her he would be sure to throw his hat through the door first. He exasperated her, but still she loved him and he loved her back. And for all the tiffs, it is easy to understand why. Mr Reagan and Lady Thatcher were both political outsidersoptimistic radicals, initially sneered at and patronised by party establishments steeped in the tradition of conservative pessimism. They encouraged each other, validated each other and, in consequence, needed each other. I would bow to the Queen and Lady Thatcher. I can't think of anyone else on Earth to whom I would bow. Thank you for putting her in office in the first place. It often seemed more of a miracle to me that she became PM than that Reagan became President. I guess they both had good luck in following people as depressing as Callaghan and Carter. I love this photo, look how sincerely happy they are to see each other. As a Yank, who treasures a picture adorning my wall that I took of her years ago in front of #10, it did at least that, and made things blurry...Especially thinking of how things are for her now. It was a touching picture at the coffin. What strength she has even to come, what with her doctors' orders. But the way she is, I cannot imagine her "Going wobbly". Thank you so so much. Got me blubbing again! As a Brit and a Thatcherite...my eyes are filled with tears. I just started this thread, if your interested. The differences over the priority of taxcut vs spending cut is probably due to the difference between Parliament and Congress. Thatcher had a majority in parliament. It comes with the job of PM. It is much easiet to get a program through because vote is partyline. Reagan had an opposition Congress that would not permit spending cuts. So you take what you can get. Thanks muchly for the pics. Her by the coffin will be an abiding memory. I cannot help drooling over your beautiful 'Mag/Reagan' pic. I just loved the time when they were in office during the 80s.